i spent the entire day milling about the mall, and, well, i am just going to have to come out and say it. i think automatic flushers do more harm than good. i bought huck some skinny jeans from the little girl's department at h&m, and also what i am calling my "blogging sweater," which is basically a poncho. it is made entirely of acrylic fibers and i could not be more pleased! today i asked my sister what kinds of things they say about me when i'm not around. she pursed her lips and cocked her head to the side in thought. "dad always says, 'she's got an awful lot of shirley in her,'" she said. well, i know what he means by that. shirley is my crazy granny goose (and my middle name namesake). this afternoon, my huckleberry and i accompanied my crazy granny goose shirley jean on a whirlwind shopping expedition. because, as my crazy shirley jean would say: "well it's just terrible, i have such needs." later, shirley jean entertained us with a very detailed account of two lions that only killed people to eat them (? ), only before she could get too far into it, monty (who has a horrible head cold) interrupted her with a terrible-sounding snarf, upon which time my crazy shirley jean had to halt ceremoniously in order to give him "the look." this just in: "i have to get in a certain mindset before i wear these shoes," she is saying to my mother. so yes, i know what my dad means when he says there is an awful lot of shirley in me. but i think that's okay. i spent a good bit of time today looking at the two photos above. the one on the left is of my dad and his family (it's not hard to guess which one is my dad, my baby has that exact same face). 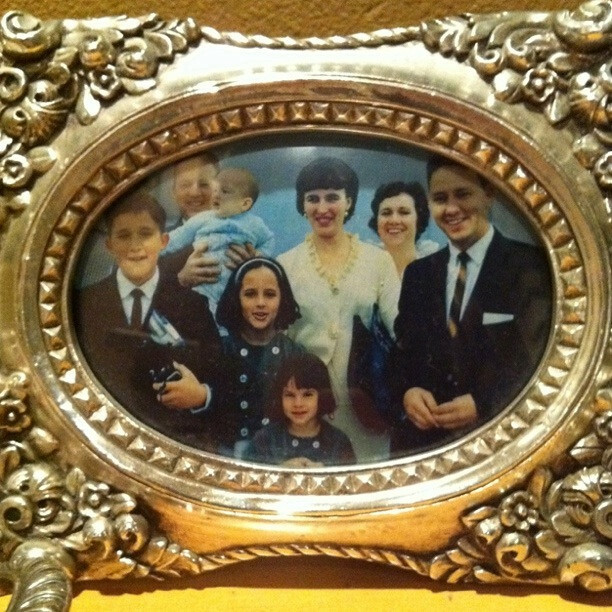 it was probably taken about 1965. on the right is a photo of my mom's family, probably taken about the same time. 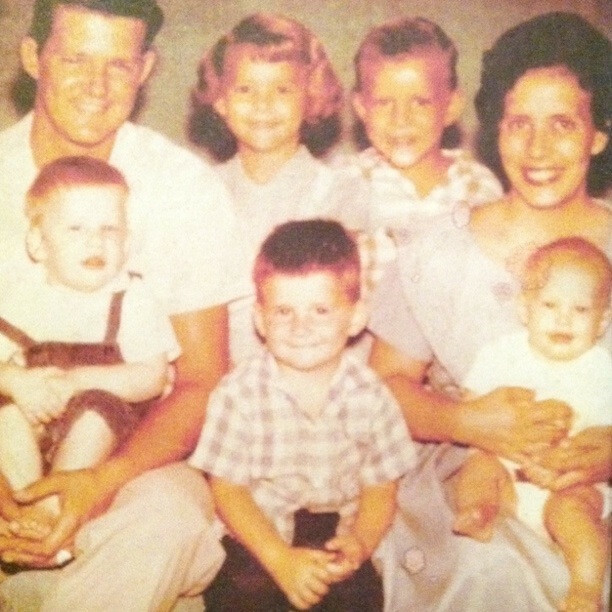 (my mom is the youngest girl in the bottom center. shirley is in the cream suit.) i just love how my mom's family is all stylish and sleek, Mad Men style, while my dad's family looks like a bunch of hillbillies with their shirts untucked. a-lot-of-shirley-in-me or no, there is something about that rag tag army of cowlicks and white tee shirts that's really speaking to me lately. in any case, it's good to be home. does having kids mean the end of life as we know it? also traveling tips, and more traveling tips. and my favorite playlist to clean the bathroom to. knowing that you have this shirley in your life makes so much sense as to why you are the way that you are. and i mean that in the best way possible, of course. Man, the hodge podge of this post made me smile. Thanks. Your writing is absolutely delightful to read! I love it every time! I love being home with the fam! I'm in Hood River (about an hour east of Portland on the Columbia River) visiting my family right now and I'm so in love with the craziness! I hope you're having a fabulous time and I'm jeal of your poncho H&M find!! I love how you write--with no rules. It's raw & wonderful. Thank you :) makes me smile always to read what you have to say. mmm portland. makes me want to snuggle with a blanket and wear a scarf in doors. Ok, maybe this is not nice to say, but it has to be said. The boy on the far left in your mom's family picture (possibly your uncle?) looks exactly like Dudley, Harry Potter's spoiled cousin. The end. If you wrote children's books, I would buy every single one of them. You have a way with words. There is definitely somebody in that big city dying to publish you. Just sayin'.